Rosie and Paul have lived a carefree and joyous life in Paris, France, until their ideal world comes to an end with the turmoil of World War II when they are forced to take refuge. 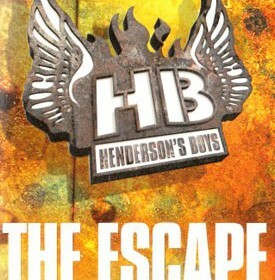 Their only hope being two words spoken by their dad: “Find Henderson.” At the same time in another part of France, Marc is an orphan, living in an abhorrent orphanage where it is crowded, hot, smelly, and he is beaten frequently, until he makes the most daring decision of his life. Robert Muchamore’s the Escape captivated me with its intense action coupled with its realistic historical relevance in order to create a true world within the story. The Escape demonstrates a theme of friendship, and examines how loyalty is necessary during tough times. In addition, Robert Muchamore has a great way of developing characters, by creating a unique personality for each one of them that does not change throughout the book. An example of this being how some characters are absolutely despicable, while others are fairly likeable even though they have some flaws. This adds to the effectiveness of the theme being relevant throughout the story. Similarly, because the characters are so well developed, the friendship and loyalty becomes more realistic. However, I thought that Robert Muchamore could have done a better job of describing the setting as this should have been a very important part of the story. There was some setting description, but it was limited so that I was left to imagine most of it, which could be looked upon favorably by some people, but I found it limiting. For example, at one point in the book it says, “They entered Bordeaux and it was getting dark out.” Here, the characters were entering a town for the first time and all that was being described was the time of day. Granted, the characters were constantly on the run, so it might have been too much writing and become boring if there was extremely clear detail about setting, however I think this would have been a useful opportunity to add more feel to the scenes. Conversely, I enjoyed reading the story because the characters were so believable and realistic, that this almost compensated for the lack of thorough detail within the location and surroundings of the characters. In conclusion, although, The Escape definitely targets a more mature audience (because of some swearing and violence), for people who enjoy historical books, and/or action books, The Escape will be a quick and fun read that will leave you begging to know more.